Why Does Copper River Salmon Taste So Good? Well, it turns out, the answer comes down to location, location, location. Anyone lucky enough to be served a filet of Copper River salmon will immediately notice its bright orange or red color, firm texture, and succulent taste. Truly, this is fish so flavorful that any added sauce or garnish just gets in the way. Below, we get into what makes it that way, and share some foolproof tips for selecting the perfect salmon. Salmon is one of the healthiest fish in the world to consume — these babies are packed with omega-3 fatty acids, are high in protein and low in saturated fat. We’re talking a wonder food in terms of heart health benefits and low cholesterol without sacrificing one iota of taste. While both Atlantic farmed salmon and wild Pacific salmon share some of these benefits, popular species of wild salmon (around 80% of which is caught in Alaska) often taste better and are much lower in potential toxins. This comes back to the life cycle of salmon. In the wild, salmon hatch in fresh water and spend a year or more feeding before swimming downstream to the ocean. Depending on the species, the fish then spend 1-7 years in the sea before — quite amazingly — heading back to the same exact river or stream of their birth to spawn. This means they have to swim vigorously upstream for miles and miles. The larger species of salmon have a longer journey and colder waters to combat, so they store huge reserves of energy in the form of fat. In turn, the stored fat correlates to their delectable taste and high nutritional value. Wild salmon are also distinguished by their deeper red color, which is due to a diet rich is carotenoids (the same antioxidant pigment that dyes carrots). All in all, farm-raised salmon have a tough time competing in this race, as their fat composition builds from a less natural diet of grain and vegetable oils. Fittingly, the most sought after species of wild salmon is the King (also known as Chinook), followed by Sockeye and Coho. Headed by the Kings, which can weigh in at up to a whopping 125 pounds, these three species of salmon spend years maturing in both fresh and seawater. Their flesh is also the densest in carotenoids and they face the most arduous journeys during spawning season. All three vary in taste — the King the most buttery, Sockeye more intensely flavorful, and Coho the mildest. 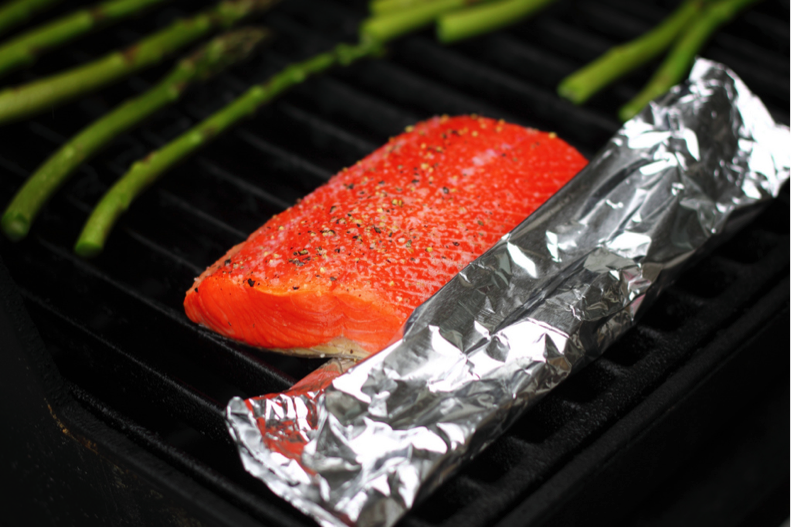 Sockeye and Coho make for great grilling, while the king’s flavor is perfect for baking. In contrast, lighter Pink and Chum salmons spend less time in fresh water before migrating to the ocean, and their lower fat content and drier texture makes them more popular for canning and smoking. What was that about location? All three species of prestigious wild salmon can be fished near or in the Copper River. What makes them particularly unique and flavorful, however, is the journey they take to get there. The Copper River watershed represents a truly punishing voyage, as it is over 300 miles from Prince William Sound to the salmon’s original spawning pools. Not only that, but the water itself is something else—this is a wild, gushing river of icy glacial runoff from the imposing Chugach and St. Elias Wrangell Mountains. It takes a lot of muscle to make it, not to mention a lot of fat. Here’s another fun fact: salmon cease to eat when they begin their freshwater pilgrimage. That means any salmon caught on the Copper River watershed will be dense with the same fat linked to a moister texture and better taste in preparation for the grueling miles ahead. In order to protect their catch and its sustainability, fishermen on the Copper River use the best available practices when harvesting salmon. Utilizing a process called trolling, they pull their gillnets in frequently, which is considered a low impact form of fishing. After being caught, Copper River salmon are iced and shipped by air directly from the processor. Hello, freshness! 1. Check the color. Salmon do vary in color, so redder is not always better. However, if the filet shows signs of bruising or browning, leave it be. 2. A quality salmon should also have a firm texture and spring back to the touch. 3. Check the sustainability of the source by verifying if the Marine Stewardship Council has given it the okay. The Blue Ocean Institute program also rates fisheries green or yellow for their environmentally friendly practices. The love affair between fresh, healthy salmon and your taste buds is probably one you’ll want to nurture for a lifetime. Do yourself a favor and order Copper River salmon when it pops up on your menu or hits the marketplace in early summer. Trust us, each bite of wild Alaskan salmon is worth every penny.